The photographs were taken in the years 2014 to 2017 at different times and sun positions. All scenes except the last where made with rawopint. This can be seen on the pumping sun. 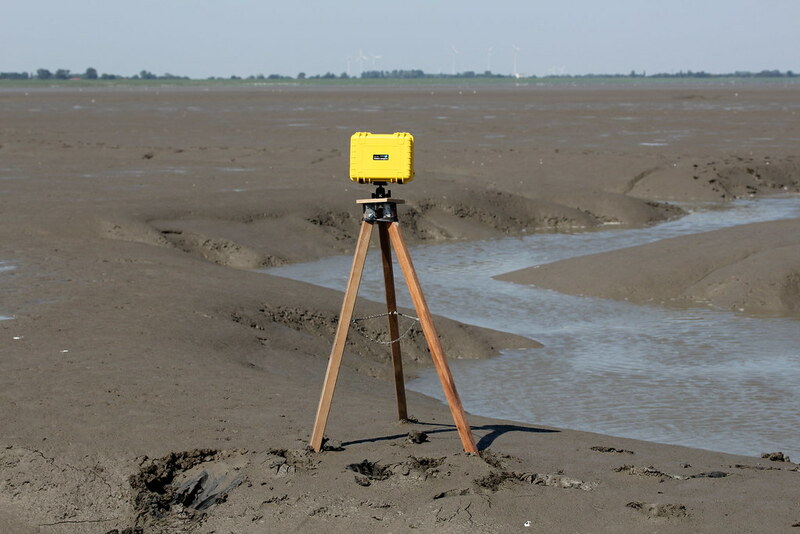 Shots in the Wadden Sea prove to be extremely difficult. 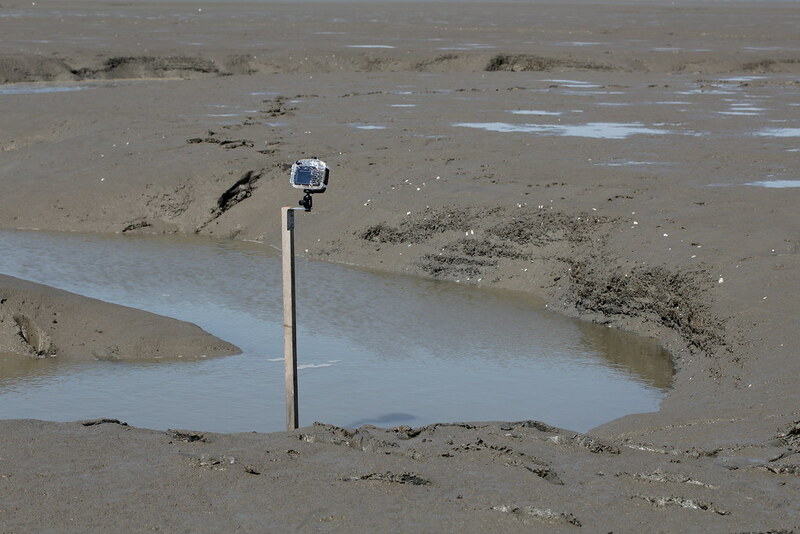 Due to wind and weather and the strong current (about 4m tidal range) it is almost impossible to find a safe position for the cameras. It is very much post-processing necessary. Due to the many movements, the use of long exposure times is almost impossible, but they are necessary to smooth the water to some extent. As soon as the water touches the feet of the tripod, it will vibrate. The post-processing is very complex. First, the individual images must be aligned (image registration). Then I run a median on the images to eliminate birds and individual events. Finally, I smooth the scene by averaging several pictures (motion blur). Camera Powershot A470, shooting continuously, ISO 800, shutter speed 1 s, shooting interval about 1.5 s. Post processing involved subtracting a median image of the 1100 images in the sequence from each image, followed by heavy wavelet-denoising (2% image magick). That came out quite nice. fixedint (https://chdk.setepontos.com/index.php?topic=12695.0) might be better for this kind of situation, rawopint metering isn't likely to help the exposure. How the median image does looks like? I might even sort out some completely black pictures. The black images probably have the smallest JPG size. I would agree with that. Just the individual flashes can bring the control quite confused. It might be interesting to think about what settings or variant of the script would work well for a thunderstorm through sunset or sunrise. The log file from @SkepticaLee might be interesting…. The problem is similar to the moon when a cloud comes or fireworks. The dark phases increase the exposure massively, which then leads to overexposure. I would work with the solution that I have already described here and that works quite well with the moon. I work with two different "Max Ev change" values. One for positive and one for negative values. For the positive values I then set to 0. This then leads to the fact that in the dark phases, the exposure is not increased. It is important that the 'pre shoot' is not underexposed already. He should rather be a bit overexposed. Of course, one could take alternative fixedint. Again, this would probably have a positive effect if you had an overexposure protection with histogram. Some Time-lapse examples from EOS M3 + EF-S 55-250mm f/4-5.6 IS STM with 250mm (400mm equivalent focal length). The lens offers a very good price performance ratio. The lens flares keep within limits. The colors are very extreme, but were not changed in the RAW development. Especially with this focal length you should be very careful that the sensor and lens are not damaged. It is cautioned. In this video the maxim Sensor temperature was around 50 degrees Celsius. The local temperature on the sensor was probably much higher. The interval for the first scene was 2.5s, for the other 1.5s. In this video the birds were eliminated with a VirtualDub plugin ‘BerconBirdRemoval’. Basically, the plugin works quite well. However, the wings of the wind turbines were shortened as well. In this case, I took the wings from the video with the birds (merge 2 videos). For comparison, here's a video (second scene) that I have recorded in parallel with the SX50. You can see the strong lens flares at the beginning of the scene. The distance I did not choose correctly. The 16: 9 bleed has lost some of the cactus. Even with the background and the lighting, there is still room for improvement. I created the whole thing with a modified version of rawopint. This version prevents small changes in exposure. This led to this time lapse that the exposure has not changed at all. I this case I could use fixedint It was important to me in this case to see if it can come at this period without problems. The sensor temperature was pretty much 50 degrees. No idea if this leads to long-term problems for the sensor. Would you consider sharing that modified version of the script, or, at least, sharing the parameters you used? And, what about that 'temperature' issues? Could it be 'dangerous' in any way? and, what can we do to avoid that risks? sharing the parameters you used? In most of my post you will find rawopint.csv log files. You will find the settings in the log file. It’s always good to start with default params. And, what about that 'temperature' issues? I don’t care so much about it. My G1x was until 70 degree Celsius. Could it be 'dangerous' in any way? and, what can we do to avoid that risks? RAW average: interesting examples here!